KUWAIT: 19 September 2018: For the first time, Abdulmohsen Abdulaziz Al Babtain Company (AABC), the authorized dealer of Nissan vehicles in the State of Kuwait, is offering its loyal customers the biggest leasing offer available across all models to enjoy the exquisite experience on Kuwait’s roads. Nissan Al Babtain guarantees attractive leasing prices in addition to a benefit package of free comprehensive insurance, free maintenance, a replacement car and several benefits that comes along with the leasing offer guaranteeing peace of mind to all Nissan’s customers. The offer includes a line-up of all of its vehicles, some of its popular models include the Nissan ALTIMA, backed by a 2.5L – 182Hp engine, and the Nissan X-Trail, referred to as the perfect car for family adventures in Kuwait and ensuring optimal convenience and security in every touch, in terms of safety, design and advanced specifications such as an intelligent rear view mirror that acts as a screen for added passenger comfort. Some of the vehicles that the new offer includes is The Hero of all Terrain - Nissan Patrol which is available with 6-cylinder and 8-cylinder engines to accommodate both the city and desert driving experiences. 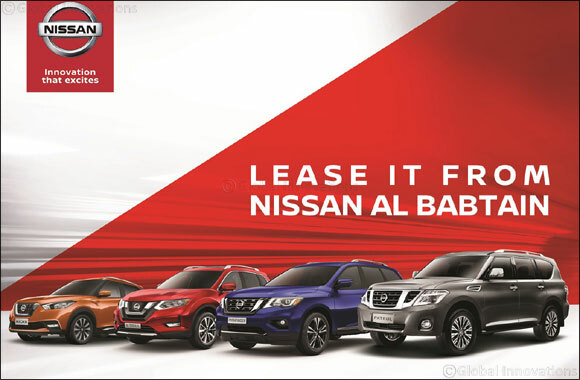 Nissan Al Babtain welcomes all to join in the exclusive leasing offer and visit Nissan Al Babtain showrooms located in Al Rai and Al Ahmadi area.